Representing memories of a dream vacation. After releasing an earring modeled after the common clothespin, AMBUSH recently dropped a necklace inspired by the tropics and fun in the sun. Constructed of .925 silver, the outlandish accessory features a resin charm etched with a palm tree beach print attached to a clasp key ring. 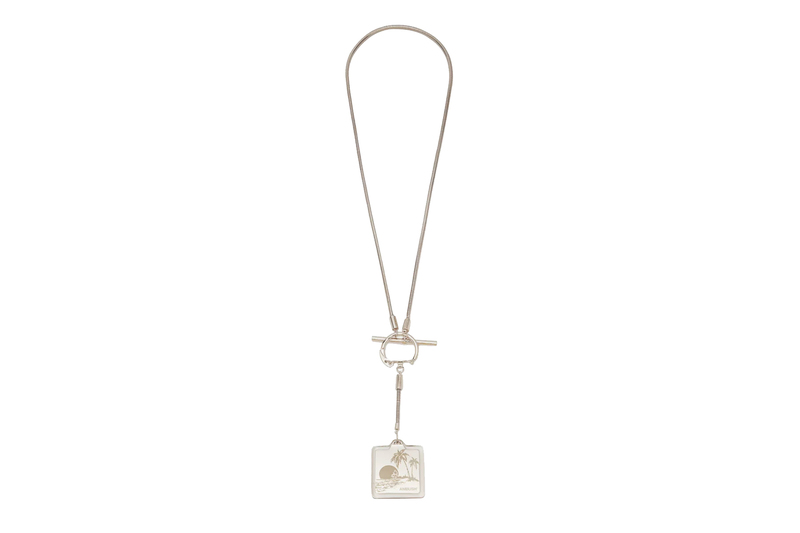 The charm is suspended from a large loop-through fastening on a matching snake chain. Finishing up the design of the necklace centered around memories of a dream vacation, embossed AMBUSH branding is found on the ends of the chain. Priced at $758 USD, AMBUSH’s Souvenir Key-Ring Necklace is available now at MATCHESFASHION.COM. Off their impressive ‘Homicide Boyz’ project. Perfect fits for everyday wear. The first of two colorways set to drop in the near future.